jesus follower living in the midwest with husband, kiddos, and pup. skills, passions, and favs include digital design, root vegetables, creating, running, photography, outdoors, in no particular order. current fav scripture: Rev 12:11 They overcame because of the blood of the Lamb and because of the word of their testimony. A few years ago I was part of a women’s bible study called Seamless. This study guides you through the entire Bible, start to finish, showing the connections of God’s plan for us, from Creation to Jesus, to the Early Church, and everything in between. It showed the seamlessness of the Bible, and how it all fits together when you look at the bigger plan of salvation. I absolutely LOVED this study! For so many years I felt like the Old Testament was a bunch of separate Sunday School stories that were anything but seamless. I didn’t understand the timelines or eras, and while I knew some of the main characters and plots, I didn’t have it “mapped out” and how it all points to Jesus. In the last month of Bible Journal entries we have moved from Kings to Prophets. Thanks for following along with us as we uncover these early leaders in the Old Testament. If you take a step back, you can see that God’s people have been led by Priests, Judges, Kings, and Prophets, each role spanning different time periods and for different reasons. God used the prophets to guide His people back to him. Stick with us – it really does all come together and point to Jesus! Today I get to introduce you to Ezekiel. He (and other Israelites) have been living in exile for five years in Babylon, at the hand of King Jehoiachin. The next few days we will cover more scripture from Ezekiel – and heads up, it gets pretty interesting. Chapter 1 he leads right off with a vision that God gave him, of the glory of God. Take a few minutes and read it. Do you need a pen and paper to draw out what he is describing, to keep it all straight? All the features, and body parts and animals? I’m not a bible scholar or dream interpreter…and it’s hard to know what to make of all of this! I read this several times and I thought and prayed… Okay Lord, what do you want me to learn from this? I’d truly be guessing if I tried to share some big theological explanation of what his vision could symbolize and mean. When I was studying and digging deeper into this chapter, I found a lot of smart opinions and guesses out there. If you’re into that kind of stuff, your bible may have a lot of cool footnotes, or google and dig around the web. When I did an image search for ‘Ezekiel 1 Vision Picture of God’s Glory’ it was crazy to see all of the different ways artists interpreted Ezekiel’s description – the picture in my mind was completely different! I also found it fascinating how one source compared verse ten’s four faces (man, lion, ox, eagle) to Jesus. Jesus is fully man, he is king and victorious like a lion, he is a servant and sacrifice like an ox, and he transcends and is spiritually sovereign like the eagle. Chapters like this leave me curious and hungry to understand more – heaven, come quick! First, Ezekiel is BOLD. And like I said – STAY TUNED – there’s more coming. He’s clearly being directed by the Lord, and has no qualms about telling the Israelites every detail of what he just saw. They’re living in exile, and God is using Ezekiel to share His message with His people. What message does God have for you to share? Maybe it’s not an indescribable being from a vision, maybe it’s your own life experiences. Maybe it’s not a message for a people group living in exile.. maybe it’s something God has for you to share with your family, a group of teens at your church, or some co-workers. I’m encouraged to be BOLD, even at the risk of sounding a little loony. Second, Ezekiel is reverent. Verse 28 tells us that when he sees all of this he falls on his face. He didn’t run and hide in fear. He didn’t look the creature in the eye or give him a high five. He went to the ground, face down, to show his humility, awe, worship, and adoration. Have you had those fall to your knees or go face down moments in your faith journey? Those deeply spiritual moments you can always go back to, that can draw your heart to worship and praise? Whether the circumstances were tragic or triumphant – your only response was one of complete surrender? We don’t have to wait for heaven to experience the glory of God – what a gift! Let’s ask God to help us see His glory today! Seven weeks ago, my best friend’s baby Briar went to be with Jesus, at 22 weeks old, before she ever took her first breath, cooed with her first smile, or wobbled to her first step. The sole comfort in this tragedy has been having absolute peace and comfort of where she now is. In the days and weeks following, my kids (ages 8 and 5) have asked some hard, thought provoking, and inspiring questions. Why did Briar die? Did she believe in Jesus? How come she gets to go to heaven right away? That last question brought all the tears back. What a sweet perspective – Briar GETS TO go to heaven first! She skips right past all of the things of this world and is right in the arms of Jesus, made perfectly whole in Him. God will celebrate with us and bless us. God will end death and sorrow. What I notice most of all is His presence. Take another read through this chapter – can you feel how close He is to His people? Hosting a feast… wiping our tears. The people are celebrating and singing “THIS is our God, that we have waited for.. let’s rejoice!” What a beautiful picture of God with His people. This isn’t a distant God, but a God that is near, hands on.. comforting us, rescuing us, eating with us. The best part of Heaven, really will be God’s presence! 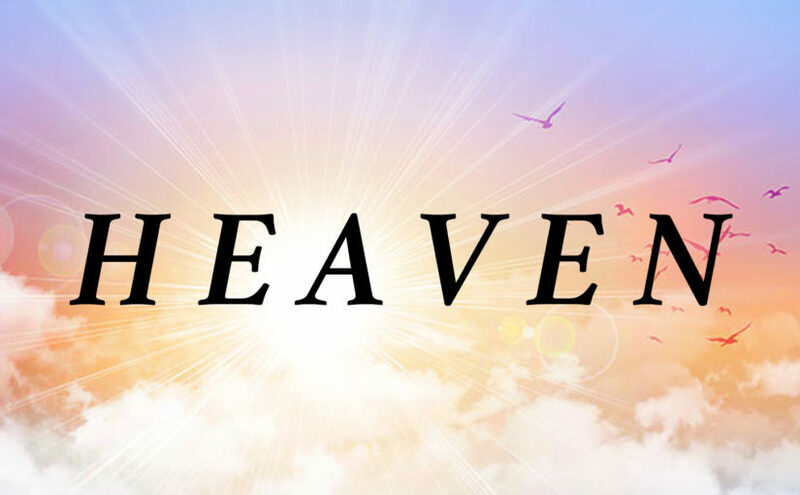 Yes, Heaven will be the end of suffering, sin, health problems, anxiety, wars, famine, bills, jobs, death, fear, violence, discord, pride… ALL of it! But what’s even greater than our lives being made whole, is WHO we will be dwelling with. Sometimes my view of heaven becomes the absence of all the struggles of this earth along with big family and friends reunion of people that have gone on before. This passage really repositions my heart to focus on the BEST part of Heaven. Being in the presence of our perfect Father. When my kids talk about heaven, they get so excited and first talk doing stuff with Jesus… it’s a humbling reminder for me to keep my child-like faith and my eyes on Jesus. Yesterday Jon shared some awesome testimonies of Elijah’s faith, and as we move into chapter 18, his faith continues to grow. Ahab, the king, and his wife Jezebel, have quit following God and have taken up idol worship in the form of Baal. There is a drought and famine in the land and God continues to protect and use Elijah amidst the chaos. Read through this chapter a few times and see if you can get a picture of this entire situation: 1 Kings 18. There are so many messages that stand out, from God telling Elijah he would send the rain…to Obadiah’s brave message delivery in the face of his own fear… to the showdown on Mount Carmel. The events that take place are so victorious and faith affirming! Limping. What a perfect description of my life as a sinner, hobbling from one poor choice to another, despite having moments of faith or even knowing the truth. But we hobble around and end up miserable in our own junk. This was my life in a big way before I made a commitment to follow Jesus. My limping back and forth wasn’t out of disbelief in God…but because I couldn’t figure out grace, and didn’t have the Holy Spirit living in me. I was bouncing around like a pinball game! And guess what? Even as a Christ follower, there is still junk! And while my limping and hobbling isn’t between God and Baal, it is between the spirit and the flesh. I love how Jesus warns us that our spirit is willing but our flesh is weak. Amen! My flesh is weak when I want to give a snarky remark to someone. My flesh is weak when I go into a defense mode. My flesh is weak when I break the law because I lie to myself that it doesn’t apply to me, or that law is for other people. My flesh is weak when I stay up worrying all night about things that are far beyond my control. Are you limping today? How long will you go back and forth? I’m praying for healing from my limping, will you join me? Matthew 6:24 tells us that No man can serve two masters. Not God and Baal. Not God and Greed. Not God and Fear. Not God and ______. Whatever is in your blank, let’s answer Elijah’s question together today and end the limping back and forth. Victory is ours! The past week and a half we have been following King David, great great great…. grandpa to Jesus. He was victorious in battle, courageous yet meek. He showed loyalty and mercy to King Saul when he had the opportunity and motive to kill him. He displayed a deep love and friendship with Jonathon. He seems to truly seek the Lord and have a heart to follow. He’s a master of poetry and song, able to put words to his swirling thoughts and emotions. As we come into 2 Samuel 11, we hit a major turning point. How does this “man after God’s own heart” fall into such sin? It appears to happen slowly over time and also all at once. Just. Like. Us. Before Bathsheba, David had married six different women over a period of time – and while this was becoming more acceptable of the time, God did not approve (Deut 17:17). This wasn’t God’s design – He always guides us in ways to help us. His laws are never to limit us, but to save us from separation from him, as well as the the pain and heartache the sin brings. In this case, the sin of polygamy and adultery. Lust. This self-focused sin is committed by the young and the old, the rich and the poor, male and female. Once David and Bathsheba commit adultery, it goes downhill from there pretty quickly. Scheming, Lies, Betrayal, Murder. It started with a glance that lasted too long… and ends with how all of sin ends: Displeasing the Lord (verse 27) and consequences (I won’t spoil next week’s journal entries). Just like David, being a follow of God doesn’t make me sinless – but it should lead me to sin less. It’s hard to understand how we can walk so closely with the Lord, see fruit of the Spirit in our lives, and then also fall so quickly into sin with big consequences. David’s adultery had to break God’s heart – just like it breaks his heart when we sin. And as a parent, how we feel when our own kids struggle with sin. What sin patterns can you see in your life? Can you identify what leads up to your sin? For me, it almost always starts with my thoughts. In each season of life, from childhood to now, I can see patterns of sin and how I struggled with different areas. There were seasons of dishonesty, seasons of greed, seasons of lust, seasons of pride, seasons of control. Share your testimony of working through sin! Don’t keep your struggles in darkness. As I look back on 38 years, it’s easy to feel like a professional sinner. I’m so thankful for the grace of the most perfect Forgiver. Four and a half years ago, my Moses (aka Nancy) sat on my couch and listened as I poured my heart out and shed all the tears about the crossroads I faced. My marriage was in shambles and the options I was left with were equally awful. My life felt like a game of Would You Rather and I kept going back and forth in my mind with the decision to make. Nancy brought so much wisdom. She encouraged me to wait and see what God was doing in this situation. She opened the Bible and walked me through Exodus 14, our reading for today. The Israelites didn’t want to choose either of those two options, and didn’t see a third different option. We don’t know exactly how much time spanned between them being at the Red Sea and realizing that the Egyptian army was after them, until the point God gave them a third option – parting the Red Sea. Some bible scholars think it was days… can you imagine each day the army getting closer and closer to you? Feeling so trapped and afraid? The enemy closing in? In my marriage, I felt pressure to make a quick decision, and honestly, I myself wanted to make a decision quickly and start moving in some direction, as awful as both options felt. But my Moses encouraged me to wait. Wait and let the Lord work, and He will provide a third option, or transform one of my current options. Do you think the Israelites thought the very Red Sea that they saw as a drowning death barrier, would actually become their escape route? This real event that took place 3,500 years ago brings us hope today that God can make a way when we see no way. Is your back against a wall today and you see no way out? My prayer is that you will be patient with yourself, and let God lead you, like He has the Israelites, and like He has led me. Don’t let the world rush and worry you to a hasty decision, let the Lord work. Let Him lead. Let Him heal. Let Him provide. As we study Moses and the Israelites journey to the Promised Land, it’s easy to scratch our heads and wonder why they continue to doubt the power and provision of the Lord. He shows up every time for them, always coming to their rescue. And yet, every time trouble comes their way, they anguish and have so much fear. It’s humbling to think that all these years later I do the exact same thing. When I’m in the middle of a trial, do I first trust that God is going to bring me an escape route? Do I always trust that He will provide? Or do I try to solve and control everything quickly on my own? I can look back at my life and time and time again He was working when I didn’t know it. He was preparing me in ways I didn’t see at the time. He surprised me with provisions right when I needed them. I want to better leverage my testimony of faith, into the next battle, knowing God will show up with a better option than I could have dreamed! I’m encouraged and challenged to respond more like Moses and less like the Israelites. Heavenly Father, Thank you for sending people like Nancy into my life, who have served me like Moses, to remind me of your goodness and faithfulness. Thank you for the escape route that you provide when we feel like our back is against the wall. You are the best Defender, Protector, and Provider. Amen. I love a good bible meme – you know I had to throw that in there! Yes, I’m a dork. 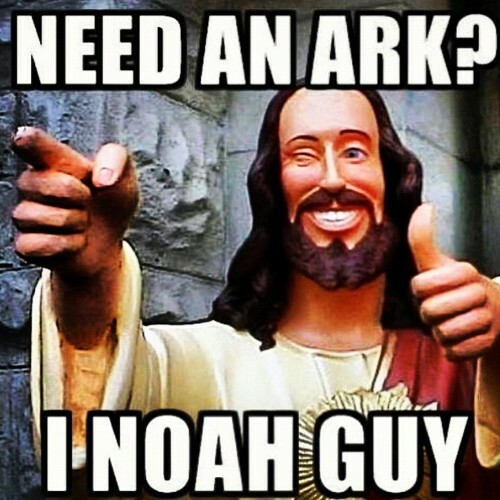 Joking aside, we reach the very real point where God tells Noah it’s time (finally). He and his family have only been working on this project for 50-75 years – depending on how you do the math. Can you imagine that much time or work on a project of this proportion? Not to mention the years they endured of questions, ridicule, and scoffing from the community? Isn’t Noah’s faith so inspiring? God told him what to do and how to plan and prep – for something that Noah would never have been able to fathom or understand. And how exactly did he catch all the animals to get them in the ark?! For those that have seen the movie Evan Almighty, do you think they just followed them onto the Ark? A few months ago, our family made the trip to the Ark Encounter in Kentucky. I really didn’t know what to expect and we were surprised with all that it had to offer. When you first arrive there is a ton of scientific research and how they came up with the conclusions they did. There is information about what is known as fact and what they speculate based on other findings, customs of the time, etc. I didn’t realize the degree of “ark doubters” in the world – I’ve taken it for granted that all Christians believed that both the ark and flood truly existed and happened. Apparently, there’s a decent sized population that believe the ark was a metaphor and didn’t actually happen. Wow – that seems like a slippery slope…where would it begin and end if some things in the Bible are metaphors and some things actually occurred? How would you know what is what, especially when all sides can tout scientific proof? Of course I have curiosities about how it all worked, and how it happened… but I believe our God is so big and so powerful, He can create something out of nothing. He can get all those animals to fit on the ark, and keep them fed while they are there. My appreciation for Noah’s faith grew, and my heart swelled from the love God has for us. Despite our sin, God sees a heart that is righteous and desires to follow Him. He is patient with us and gives us time to work out our soul’s salvation. He makes a way for us, even when we don’t understand what it will look like on the other side. He is our provider and protector. He perfectly times His plans. This time of year, between the Christmas parties and school programs, the traditions and time with family and friends, there’s also a lot of real life stuff. And it’s not always tinsel and twinkling lights. The most wonderful time of year can amplify the hurts of some and leave people feeling less than jolly, especially in comparison to others with all the cheer and mistletoe. To the momma that buried her son this year – God sees you. To the dad dividing holiday time with his kids after the divorce this year – God sees you. To the woman in the middle of cancer treatments – God sees you. To the man that lost his job and can’t pay the mortgage this month – God sees you. We are all surrounded by people with hurts – some much more visible than others. Or you may be someone with an extraordinary hurt this season, ready for the new year to come and to get back into a routine. This line from O Holy Night keeps coming to my mind, convicting me and challenging me. Am I truly thrilled and celebrating the birth of Jesus? Or do I allow the challenges of the day dim the Light of the world in my life? Do I look at my hurts, worries, stress, and allow them to be overcome with a thrill of hope? Am I rejoicing along with the weary world? Am I helping others rejoice amidst their weariness? In your hearts honor Christ the Lord as holy, always being prepared to make a defense to anyone who asks you for a reason for the hope that is in you; yet do it with gentleness and respect. Is it evident to others that I have the hope of Christ in my life? Do I have my testimony ready to share when asked about the hope I have? I don’t have the answers or solutions to all of the real life situations right now – but I do know that we can put our hope in the Lord. Because of Jesus, we have eternal life. And that truly IS thrilling! Jesus’ arrival thrilled a weary Mary and Joseph, it thrilled the weary shepherds, and it thrills a weary world! 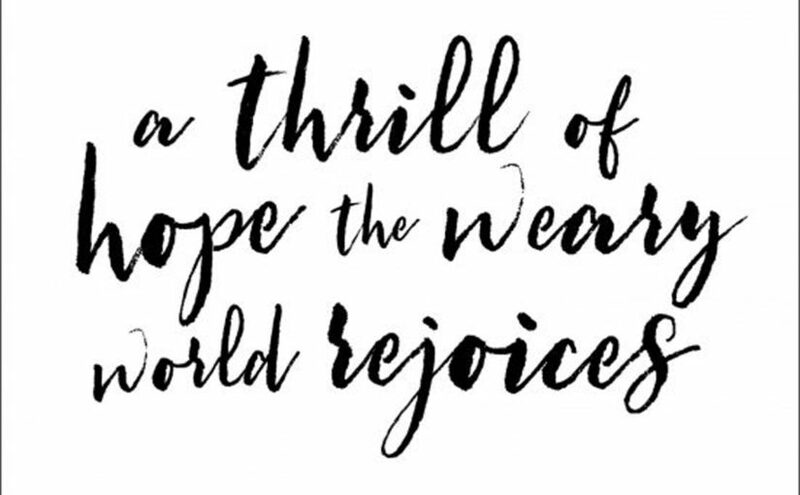 This Christmas, let the thrill of Jesus and the hope He brings, allow us to rejoice through the weariness and hurts. Not because those things aren’t real and don’t hurt – they are real and the pain is real… but we can rejoice because God sent us Jesus – and He has overcome the world! Continue steadfastly in prayer, being watchful in it with thanksgiving. At the same time, pray also for us, that God may open to us a door for the word, to declare the mystery of Christ. What does devotion to prayer look like in your life? There have been seasons in my life where every hour I was praying – sometimes every minute. Talking to God and pouring out my heart to Him was the only way through the turmoil. And not because He swooped down and fixed it in an instant, but because He was present, with me, available. I can think of other seasons where I wasn’t relying on my communication with God – and how quickly things can spiral. A good friend shared this challenge with me, and OH MAN, has it ever stuck. Do you go to the phone or do you go to the throne? ZING! So many times when something happens – from exciting news to tragic circumstances – do we pick up our phone to call and talk to someone, or do we first thank God, praise God, cry to God? I want to be someone who goes to the throne, FIRST. More consistently. The big stuff, the little stuff. I want to be a warrior in prayer and build a deeper relationship with the Lord through my prayer life. Prayer has already brought so much richness to my faith journey. I know that investing more time and focus into my prayer life will draw me closer and keep my mind on things above. When I make time to praise God for who He is – it’s so affirming for me to say out loud all of His attributes. Sometimes when I’m running I will pray the ABCs of God: “God, you are so Awesome, you are Almighty, you are my Advocate, you are the Beginning, you are the Bread of life, you are my Comforter…” and it is so powerful to meditate on each character of God and how we have seen Him work in our life. Some of the goals in my prayer life are going to take practice. Sometimes I find my mind wandering. And sometimes I feel like I’m rambling on and on, and the conversation is so one-sided, barely coming up for air. I’m trying to spend more time yielding, listening, waiting, during my prayer time. These are some ways I want to be more devoted to prayer in the coming year. In Daniel chapter 9, Daniel prays to God, and says “we don’t pray and make requests because of our righteousness, but because of Your great mercy. I love this! Our prayers aren’t because of anything we have or can do, but are completely because God gave us this channel to talk directly to Him, and He shows us so much love, comfort, and mercy, through prayer. He doesn’t care about our fancy words, He cares about our sincere hearts. Another area I want to be more devoted in prayer, is in leading others in prayer, and I have a great opportunity with my own family. Each morning on the way to school our kindergartener and third grader request “Mom, will you get the prayer sticks”. During the 6 minutes between our home and the school we try to refocus the morning frenzy of getting out the door, and prepare our hearts for the day. I know that prayer is the most important key to the success of my day, and I hope to lead my kids in strong prayer habits. 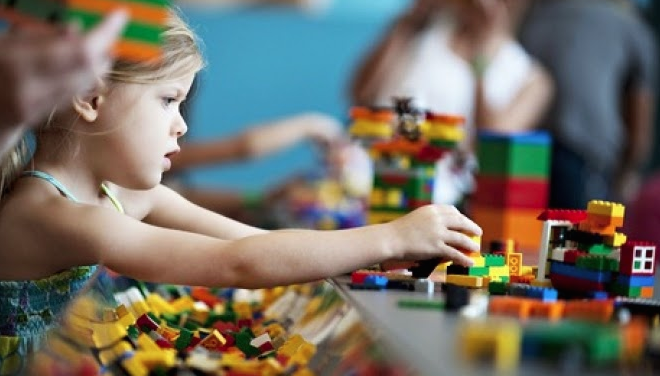 This is one small practical thing we do and our kids love it! 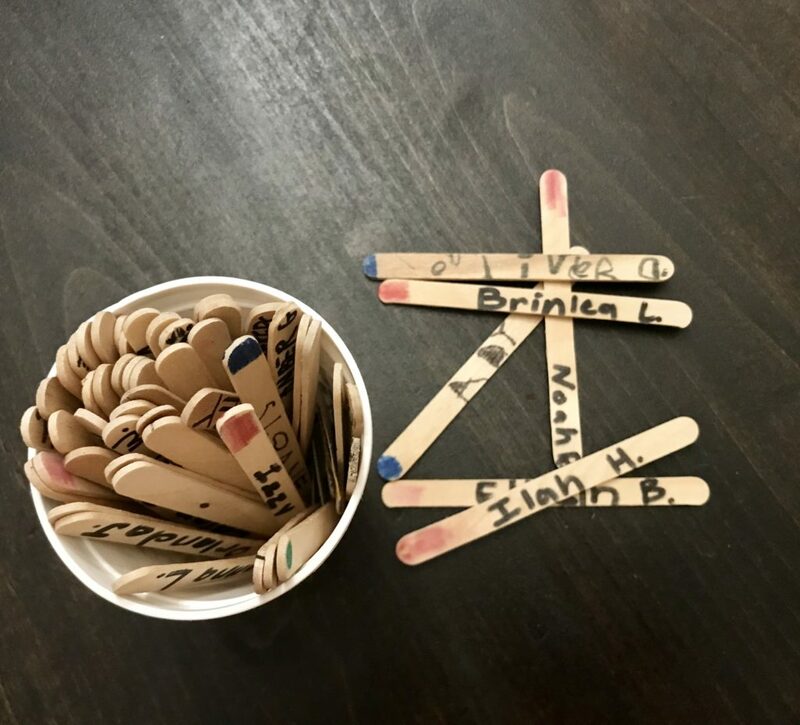 At the beginning of the school year they write down all their classmates and teacher on individual popsicle sticks. 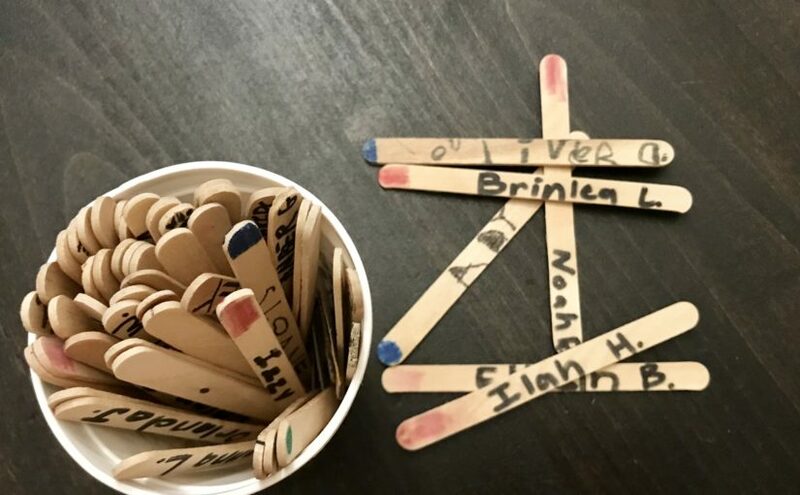 Each morning they each pull one stick out of the cup and that’s the person they pray for that morning. It’s a small and simple way to start the day. And sometimes at the end of the day they share a praise report of something specific they prayed for that friend, and how God answered that prayer. I love that they get to see God working in their world! While Jesus was on earth, He modeled prayer for us. We hear him in the garden of Gethsemane pouring his heart out to the Father. We see him retreating from the crowds to take time to pray. He tells his disciples to watch and pray. He even gives us a template of what to pray, in the Lord’s Prayer, recorded in Matthew and Luke. Prayer seems like one of those marvelous mysteries – God tells us to come to Him, let our requests be known (Philippians 4:6), all the while He already knows what is in our hearts, knows what His perfect will is, and knows the outcome of all things. I’m so thankful that we can go directly to the Father, Son, and Holy Spirit, and do not need a mediator (1 Tim 2:5). We have direct access to the Creator of the Universe, the King of all Kings wants us to talk to Him, and share our heart with Him! Do you have any prayer goals for the coming year?